Grandmother Musings blog has nominated theAfterBurnSG for a One Lovely Blog Award! She is a mother, grandmother, and teacher sharing the guts of life through humor and wisdom. Thank you for your support by providing this award. I truly appreciate your nomination and your blog. 1. Am a young-old, short-tall, fat-skinny, blonde-red-haired brunette. 2. Like the colors red, blue, yellow, orange, purple, and green, in no particular order. 3. Am organized on the outside, yet have a cluttered mind. 4. Notice the big things in small things, and the small things in big things. 5. Will celebrate anything worth celebrating. 6. Get extremely anxious around bugs with exoskeletons. 7. Am an animal-lover, but appreciate humans, too…sometimes. 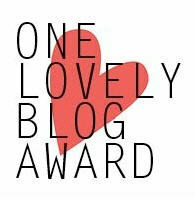 I am nominating the following extraordinary bloggers for the One Lovely Blog Award. Please check out these awesome blogs! Don’t forget your likes and comments are approximate to earmarking a page in a book, which is much appreciated to the writer. Thank you to all of you who share through blogging. How To Eat Ice Cream With Your Whole Body.